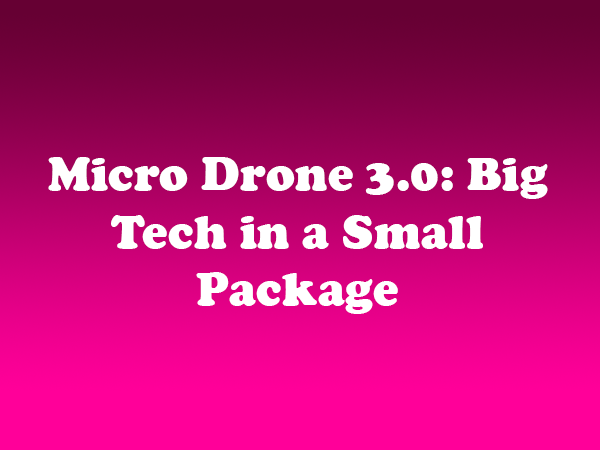 While the Micro Drone 3.0 can literally fit in the palm of your hand, it rivals some of the larger (and more expensive) consumer-level unmanned aircrafts on the market. The Micro Drone 3.0, which is the product of a crowdfunding campaign, is small, maneuverable, and packed with cool features. The tiny drone is capable of streaming HD video to a tablet or smartphone and can handle winds of 45 miles per hour. For photographers, it also includes a user-controlled gimbal, which is a first for a drone of its size. For those who are eager to shoot using a drone, but not prepared to pay for a DJI Phantom 3, the Micro Drone 3.0 is an excellent option. • HD video: The drone’s camera module shoots 720 x 1280 HD video at 30 frames per second. • Gimbal: The Micro Drone 3.0 includes the small gimbal in the world, allowing users to control the angle of the camera mid-flight. • Auto-leveling technology: The drone is equipped with intelligent motion sensors that allow it to hover and fly in straight lines. • Multiple controllers: Users can control the drone using the included radio controller or an application that works on any iOS/Android device. • Inverted flight capability: The Micro Drone 3.0 can fully invert 180 degrees and fly upside down. • Customizable frame: Users can add to the Micro Drone 3.0 base to create larger drones and can also build custom frames using 3D printing technology. The Micro Drone 3.0 is currently available via an Indiegogo campaign. Multiple price points/options are available, with the basic setup costing $175. It comes with (1) HD Camera Module and (1) Virtual Reality Headset. This includes (1) battery, (1) charger and (1) professional handset remote control and a selection of CAD files to 3D Print custom frames. The gimbal must be purchased separately.